I have an obsession with Greek style yogurt. I love its tartness, the thick, spreadable, frosting-like texture, and it is healthy. Don’t get me wrong, I love my butter, sugar, chocolate and pork but sometimes having a break with yogurt is sometimes what I need. 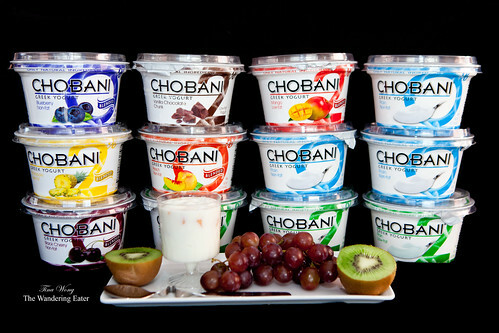 So, I went on a little nuts in getting a bunch of Chobani yogurts from my local market ranging from plain 0% (great for cooking and baking) to flavored ones that I tend to have for breakfast or as a light dessert to end my day. Almost anyone know how to make a yogurt parfait, so I won’t waste either of our time to build one but I’ll give you interesting recipes to elevate the your breakfast or dessert table. As you know I like complex flavored foods. 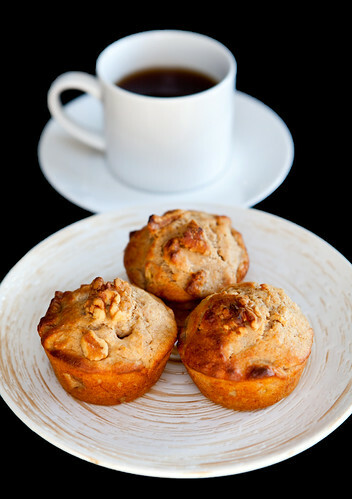 So, it won’t be a complete surprised that I wanted to go beyond a standard whole wheat banana yogurt muffins’ name would be longer than I wanted it to be – whole wheat banana walnut, candied ginger, pineapple yogurt muffins. The inspiration was the tropics and thinking that one of my guinea pigs (my parents and friends) love ginger, I thought this should work. The yogurt develops a delicate texture and sweet, tropic flavor and the toasted walnuts provide an appealing flavor and texture. The ginger gives it a spicy bite. My family and friends inhaled them for brunch. A serendipitous craving, I guess you may put it was my craving for frozen yogurt over the weekend. Unintentionally, I stuck with my Asian/exotic flavor theme, and found some fresh lemongrass at my local ethic grocery store. If you never tasted lemongrass before, it has the flavor like a lemon but it does not have the bitterness of a lemon (if you bite into a lemon from pulp, pith (the white part of the skin) to skin like I have when I was a crazy, curious kid, you’ll know the difference). Lemongrass is not an edible plant but it has so much flavor hence it is so popular in Thai and Southeast Asian cuisines. 1. Preheat the oven to 180°C (350°F) and line a standard 12-cup muffin tin with cupcake liners. 2. In a large bowl, combine the flour, sugar, baking soda and salt. In a separate large bowl, whisk all of the liquid ingredients (egg, egg yolk, mashed bananas, yogurt, and olive oil). 3. Add the liquid ingredients to the dry. Dump in the crystallized ginger and walnuts. Stir until just combined. 4. Fill the cupcake liners 3/4 full with batter. Bake for 20-25 minutes, until a skewer inserted comes out clean. 1. Put the lemongrass and milk in a blender and blend until the lemongrass in finely chopped. Transfer the mixture to a medium saucepan, add the sugar and salt, and warm over medium heat, stirring occasionally, until bubbles begin to form around the edge. Remove from the heat and let sit for 15 minutes. 2. Whisk the egg yolks in a medium mixing bowl until broken; set aside. Pour 1/2 cup of the warm milk mixture onto the yolks in a slow, steady stream, whisking constantly. Transfer the yolk mixture back to the sauce pan, set over low heat, and cook, stirring constantly, until the mixture is thick enough to coat the back of a wooden spoon and registers 165°F, about 5 minutes. 3. Strain the mixture thorough a fine-mesh sieve into a large bowl, pressing all of the liquid out of the lemongrass. Cool the mixture until it is lukewarm, about 20 minutes. 4. Stir the yogurt and lemon juice into the milk mixture. Cover and refrigerate until cold. 5. 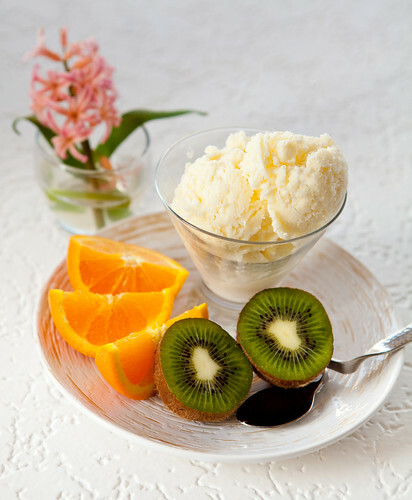 Transfer the mixture to your ice cream maker and freeze following your ice cream maker’s manufacturer instructions. Freeze for a firmer frozen yogurt. This is best enjoyed fresh, but it will keep in an airtight container in the freezer for up to 3 days. I made these muffins and they were amazing!!! I subbed in coconu oil. Great flavor combo. I way too lazy to make ice cream….. I love the new chobani bite fig and orange zest (crazy good) and i just shove a popsicle stick thru the papery lids and turn them into chobanicicles!